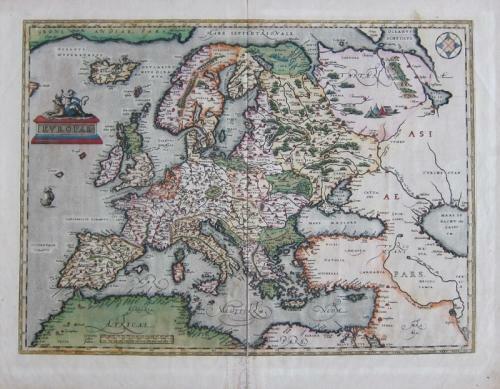 A classic map of Europe that derives from Mercator's work; Russia from Jenkinson's map; Scandanavia from Olaus Magnus. The relatively modest cartouche shows a partially covered and apparently distraught Europa sitting on the back of a placid Zeus as a bull (and lover of Europa), both gazing toward Europe. Published in the atlas Theatrum Orbis Terrarum. In very good condition with a margin reinforcement to the verso and a couple of small margin repairs (not affecting the image).